Which of the following is true regarding seat belts and child restraints in vehicles? You should never place an infant or small child in the front seat of a vehicle with airbags. An airbag can be dangerous to an infant or small child, even in a low-speed collision. You should always make sure all your passengers are using a seat belt or child restraint. Before you drive, always fasten your seat belt and make sure all your passengers are using seat belts or child restraints. Studies have shown that if you use seat belts, your chances of being hurt or killed in a traffic crash are greatly reduced. Children age 12 and under should always ride properly restrained in a rear seat. Never put a rear-facing infant restraint in the front seat of a vehicle with a front passenger airbag. You do not have to stop for a school bus that is stopped with its red lights flashing if it is on a private road. When a school bus is stopped with its red lights flashing and stop arm out, other drivers are required to stop. This law applies to drivers traveling on both public and private roads. The road ahead turns sharply right, then sharply left. 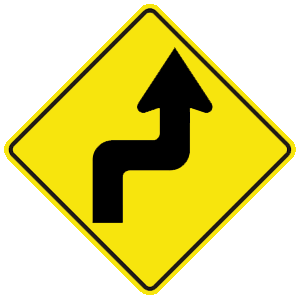 This sign indicates that the road ahead turns sharply to the right and then sharply to the left.